Joining our already impressive lineup of aluminum doors is the 90-Degree Stacking Sliding Door. This innovative design is not only aesthetically striking, but also provides practical benefits superior to traditional designs. The 90-Degree corner unit utilises a pioneering ‘no post’ design that ensures no impediments to views or obstructions when operating. Whether you’re entertaining and wanting plenty of room to maneuver, or are simply enjoying the unimpeded expansive views and abundance of natural light, the 90-Degree Stacking Sliding Door is the ideal solution to any home design. 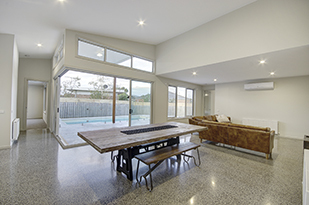 Southern Star Aluminium Stacking Sliding Doors are perfect for indoor/outdoor living, creating large open space and seamless transition from inside to outside. Ideally suited to alfresco living, stacking Sliding Doors in particular provide additional features with an opening 2/3 larger than normal Sliding Doors. Part of the 200 Series, the 90-Degree Stacking Sliding Door combines sophisticated and modern architectural design with superior quality, functionality, style and value. Like other products within the 200 Series, it can be double-glazed amongst other glazing options, providing additional environmental, energy efficiency and financial incentives. Visit a showroom or speak to one of our friendly customer service team members to find out more information on the 90 Degree Stacking Sliding Door today!